FBI video: Law officers gather around the body of the dead rancher after others in the white truck have come out. The FBI on Thursday told us what happened when several of the Malheur refuge protesters were arrested and one was killed. It demonstrated that informing the public is the right thing to do, and that it can be done in a timely manner even while a formal investigation is still going on. By now everyone who is interested has seen the FBI’s aerial footage of the events on the snow-lined Burns-John Day Highway on Tuesday afternoon. It’s available on YouTube if you’ve missed it. 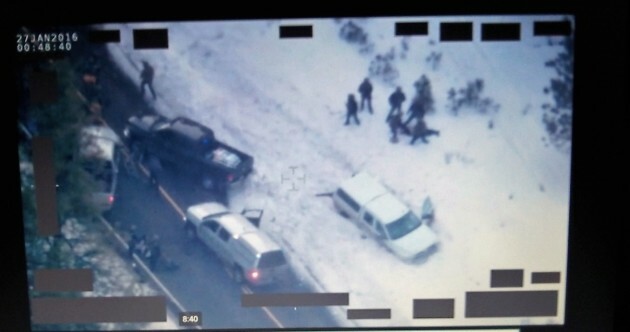 It shows rancher LaVoy Finicum driving away from officers, steering into a snow bank when his truck reaches a roadblock, getting out of the truck, walking into the snow with his arms up and then apparently reaching into the left inside of his coat with his right arm. That’s when he goes down. Bretzing said Oregon State Police troopers shot him, and a loaded 9-mm pistol was found in his jacket pocket. The state police followed up with an email quoting their policy on when deadly force is justified. It is when an officer reasonably believes it is necessary to defend the officer or others from serious physical harm. On the video we cannot hear what anyone said. There may still be questions, such as why anyone including some media called this a “traffic stop,” when it was clearly a big-time planned operation complete with aerial coverage to capture these people. And it would be interesting to know whether the officers on the ground had body cameras that captured the action in more detail than was shown in that fuzzy video from the air. It shows that OSP performed their duty as they should. It’s imortant to note that for those people that did not watch the entire 26 minutes that Finicum had stopped for 4 minutes, then sped off at high speed to elude police. He almost hit a police officer as he attempted to elude the roadblock. While he had his hands in the air as he exited, at least twice he dropped his hands and reached inside his coat before he was shot. Police found a gun in a pocket where he was reaching. Given his pronouncements the he “would rather die than live in a cage” this may, in the end, be evidence of suicide by cop. Now we will hear the apologists denounce “the government” for the arrests of these criminals, and the death of a man who CLEARLY brought it on to himself. I sincerely hope you do not join that irrational chorus. Watching this edited, redacted video doesn’t show me anything that the FBI etal was correct in their action. It indicates just more stalling while they get their stories straight. The entire un-edited video is available on the FBI channel on You Tube and has been since the FBI press conference yesterday in Burns. I watched it immediately last night. The blacked out stuff is tactical information according to the FBI. It clearly does not obstruct the view of what happened. Finicum reached into his coat at least twice, after he initiated a high-speed chase, after he ignored repeated directions to comply, after he almost ran over a cop,and while all the other members of the Bundy Gang followed law enforcement directions and were taken into custody with no problems. The only “stalling” here is from people like you who continue to fabricate issues and denigrate law enforcement, and who apparently prefer the company of thugs, seditionists and insurrectionists to the normal law abiding people of this country. What happened is a tragedy for Finicum and his friends and family. If he had followed the instructions of law enforcement he would have had his day in court, where the government still has the responsibility to prove guilt and the defendant doesn’t have to prove anything. Small detail —he reached into the left side of his jacket—was the 9mm in the left side of his jacket? Yes body cam footage would be valuable. Have no joy in seeing how things ended that day. Having said that, there were many opportunities provided by the task force for a different outcome. It appears the victim was “startled” at least by the officer on the left. Who is say/say not that officer might have actually fired first and then the victim reacted? Something I’ve observed — in the face of fact, belief always trumps while presumption becomes unassailable conclusion. Where is the balance? We always heap loads of appreciation on law enforcement officers because we say they risk their lives to protect us. Seems to me the officer who shot the victim was unwilling to accept any risk. Since when does reaching into your coat justify an execution? What if he was reaching for a cell phone/cigarette, etc.? I know after the fact he had a 9mm in the coat pocket, but the officer did not know that. This whole process of allowing an officer to kill because the officer feared for his own safety is often abused. Reminds me of the two officers who gunned down the kid with a toy that looked like a real gun, and of course the officers were acquitted because they feared for their safety. That OSP officer is tried and convicted by Judge Tom. Tom say’s it was an EXECUTION. This is the state of the radical right in 2016. Lies and gibberish. Armed men who openly said they were prepared to fight and kill law enforcement officers, and the cops aren’t taking enough risk. They’re behind a vehicle barricade, with a big pickup barreling down on them, but they didn’t shoot then. They held their fire. But to Tom they’re not taking enough risk. Every other member the gang captured was taken peaceably by law enforcement. The one man who who openly told the press he would rather die than be captured, who the police and pretty much everyone in Burns saw in the streets and at the meetings in town armed, and who was IN FACT armed, is the only one who died and you say he died because “…the officer who shot the victim was unwilling to accept the any risk”. But you go further and called it an EXECUTION – a deliberate act. You are a Judge and jury, with no evidence. Only you could claim that these are similar situations. You disgust me, and I feel pretty confident that your comments disgust the vast majority of people. I find it careless at the very least that no good capture is available. Cheap Go Pros have far better quality and sound. Good Go Pros superb $200 body cams are good. With all this planning (the trip to John day was a setup) like a half dozen or more armored vehicles, and no body cams? I don’t believe that. He could have hurt himself hitting the snowbank. He could have received shrapnel when stopped and that is why he took off. I don’t know. The FBI does not want that. Most any of the news media would have loaned them a video camera. I bet about anything half or more of those officers’ cell phones could have been used and probably were. Hasso’s own video from DH days was good enough. This blurry capture is worthless to show anything. Maybe he stepped on something uneven in that deep snow. There is no excuse for such lousy capture, just as I forecast before any was released. That is a shame and maybe a sham Fuel to the fire. Until I see more compelling evidence I’ll give the dead victim the benefit of the doubt. Remember– innocent until proven guilty. Except for the Oregon State Police officer, who you have stated executed Finnicum. After looking at enhanced copies I feel Mr. Finnicum was shot by the agent on the hill and he turned and pointed to that agent and then to where he was shot, and then shot again in the head. Let’s see if he was not also hit in the mid torso. This is the worst possible video. Every one of the officers probably had a cell phone that’d take far better video and the dash cams too. We’ll probably never see those unless they too somehow become useless.